Superman Vol. 4: Black Dawn is an ambitious outing by Peter Tomasi and Patrick Gleason. Free to use Superman continuity old and new after Superman Reborn, the two take on perhaps among the toughest Superman character to write. The result is exciting story-wise, as the culmination of Tomasi and Gleason's entire run so far, and drawn well by top talents Gleason and Doug Mahnke. In the technical details unfortunately the story collapses under its own weight, a confusing morass of elaborate and contradictory storylines, which in its freedom to use previous continuities doesn't pause to explain what's going on. In one respect Black Dawn is an exuberant example of the Superman title stretching its wings; in other respects it's a prime example of how DC Comics's long continuity (or lack thereof) can harm a story in significant ways. At the outset I'll mention that Tomasi and Gleason have an entire issue in the midst of Black Dawn, drawn by Mahnke, solely devoted to Lois Lane. It's a great chapter, as Lois and her trusty Bat-gauntlet try to escape a band of aliens; the Bat-gauntlet is destroyed here but hopefully Batman gives her a new one. Lois has at times been in the background of Superman as Clark trains Jon in his superpowers -- and the bit where Lois makes Superman, Superboy, Batman, and Robin stop lurking in the barn and come inside to have pie was too "spoilsport" for my tastes -- and her adventures have mostly been Dan Jurgens's Action Comics's purview. Her turn as an action hero is welcome here, and indeed, Black Dawn's Hamilton County setting lends itself to this being a full Kent family adventure more than Dinosaur Island, for instance. Tomasi, Gleason, and Mahnke bring back Manchester Black in this story, revealing him to be the mastermind behind most of the Kent family's troubles since the title began, both in Hamilton and with the various giant monsters. Black, in my opinion, was a perfect one-off foe in Joe Kelly, Mahnke, and Lee Bermejo's Action Comics #775, "What's So Funny About Truth, Justice, and the American Way" -- really an analogue for Authority's Jenny Sparks -- who was only lessened by further uses that tried to flesh him out as an actual character. Every other Manchester Black story begs comparison to Action Comics #775 and every other story is most certain to be the lesser; it takes very brave creators to want to use Manchester Black again. 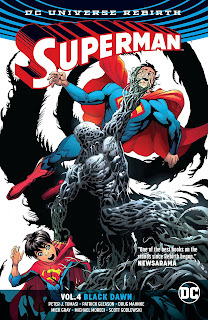 On the face of it, Black Dawn would seem to be the story of Manchester Black trying to compel Superboy to kill as Black once tried to do to Superman, in order to then take Jon under his wing for reasons unknown. Black brainwashes Jon with visions of his parents' injury toward this goal, and then sics an ensorcelled Jon on Superman. That's a fine backbone of a story, and if you add in perhaps a larger theme of Superman passing on his polemic against killing to his son (and his son's generation), maybe that would rival "What's So Funny" after all. But Black Dawn never fully gets to "to kill or not to kill" all that explicitly, in part because it gets sidetracked not only by Black being responsible for the monsters Clark and Jon have fought since this book's first issue, but also by a subplot where most of Hamilton's leadership are alien refugees. I am impressed by what a long game the writers have been playing and how even disparate stories like "Super-Monster" now gain relevance. At the same time, this is a wildly complicated plan of Black's to apparently just tease Jon with sea monsters all his life until he went bad? Since when does Black have these strange ink powers? And even re-reading "Super-Monsters," it's not totally clear how the Hamilton aliens are related or what their power set is, and what they understand about their leader Black's marauding monsters that they themselves are fighting. Further, despite the sheer panic that breaks out when Black reveals himself, the writers spend almost no time explaining Black's background or his former conflicts with Superman. I realize I'm wanting it both ways as the use of Black is the kind of deep dive (deeper, at least) that I've wanted the Rebirth Superman teams to take into the post-Crisis mythos. But when Black mentions he's been journeying "space-time" for a while, even an in-the-know fan like myself had trouble remembering the finer details of Black's last major appearance -- which, let's be clear, was over ten years and a major continuity jump ago (not counting the New 52 Teen Titans version). And heaven help a reader who just came on with Rebirth, because simply having Superman shout Black's name with no other explanation for who Black is doesn't automatically make for suspense nor reader investment. I'm not opposed to a reader having to do a little research to catch up with a storyline, but after a decade plus an alternate version, a slight flashback might have been warranted, a la Dan Jurgens and the Cyborg Superman over in Action Comics Vol. 4. Black Dawn ends with a one-off story by Mike Moreci and Scott Godlewski that contrasts Clark parenting Jon to Pa Kent parenting Clark. This is heartwarming in the main, by design, though Moreci has to posit a slightly more rebellious Jon than this book has shown previously in order for this to work; also for as antagonistic as Jon is through most of the story, his change of heart comes very quickly the first time he's thrown through a wall. At the same time, Moreci does use two of my favorite post-Crisis Superman villains, Psi-Phon and Dreadnought, and here I thought Moreci did a fine job with "always looking for a world to conquer" in clueing the reader in on them in the way Tomasi and Gleason did not for Manchester Black. As with Peter Tomasi and Patrick Gleason's Superman stories past, Superman Vol. 4: Black Dawn is loaded with charm, indeed from the Super- and Bat-families sitting down to pie to Jon Kent and Damian Wayne having a sleepover to the whole bit with Jon calling Damian "Garth." I can hardly argue with Tomasi and Gleason using Manchester Black in a story, and there's surely joy now in the fact that Superman knows who Manchester Black is and that their history has been restored. This was a rough start out of the gate for the Superman Reborn continuity, but hopefully it just gets better from here.